Really Reasonable Ribbon February Blog Hop Prize Winner! Well, my ribbon bargello background got a lot of positive feedback. I’ll be posting a tutorial on this tecnique on this blog and the RRR blog soon. You’ll be surprised how easy it is (and there is no weaving involved!). 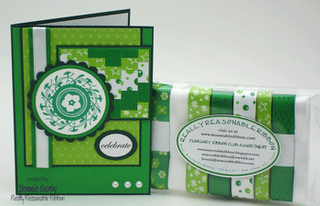 Now, for the winner of a February Ribbon Club assortment and card. The winner will have 48 hours to contact me by clicking on the ‘view my complete profile’ and then selecting the email option. Please send me your full name and shipping address. Thanks so much for visiting my new blog and have a wonderful day!